Are you looking for a clean, nicely decorated licensed facility with a home-like environment for your loved one? Come on home to Pat’s Golden Girls Inc. where we offer 24 hour geriatrics care with love and respect. 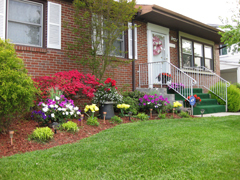 Pat’s Golden Girl’s Assisted Living, Inc.
We’re located in Baltimore County just minutes from Northwest Hospital, Shopping Centers, Parks, and Ponds which provide great outdoor activities. Copyright © 2013 PATS GOLDEN GIRLS, INC.